Within a few days I shall bury myself in the groves of Monticello and become a mere spectator to passing events. In 1806 Jefferson drew a sketch of Monticello mountain and designated eighteen acres on the northwestern side as the "grove." He envisioned a ground where "the canvas at large must be Grove, of the largest trees trimmed very high, so as to give it the appearance of open ground." Jefferson intended the Grove to be an ornamental forest with the undergrowth removed, the trees pruned and thinned, and the woodland "broken by clumps of thicket, as the open grounds of the English are broken by clumps of trees." The Grove also included a planting of ornamental trees in an open area adjacent to the West Lawn. They were chosen for the contrasting textures of their foliage. Some of the selected species are not hardy or adaptable to a mountaintop in central Virginia. Substitutions were inevitably made, and the upper part of the Grove probably became an arboretum of Jefferson's "pet trees." 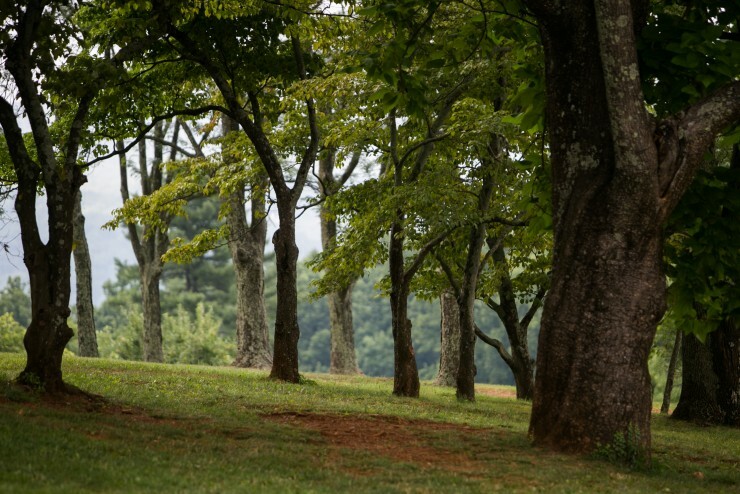 In many ways, the lower or woodland part of the Grove represented Jefferson's ideal American landscape, where "gardens may be made without expense. We have only to cut out the superabundant plants." He said that "under the constant, beaming, almost vertical sun of Virginia, shade is our Elysium." The mature, deciduous forest should be further refined with the introduction of vistas, glades, hardy perennial flowers, and a ground cover of turf. He also sketched a plan for thickets of shrubs arranged in a spiral pattern to suggest an informal labyrinth. Furthermore, Jefferson hoped "to procure a Buck-elk, to be, as it were, monarch of the wood," and suggested stumps should be left "where they might be picturesque." Although it is uncertain how much of the Grove was actively maintained by Jefferson, a project was begun to recreate the concept in 1977. The existing forest was cleared and thinned, young trees, shrubs, and herbaceous flowers planted, and vistas, glades, and thickets introduced as Jefferson had envisioned. Monticello's "Upper Grove," at the western end of the Winding Flower Walk, is accessible to anyone with a ticket.